So Nam and Deepak turned up right on the dot, and after So Nam had a cup of tea, we went of to the Buddha Dordenma. The Buddha statue was visible even from our hotel room, and on our drive up to the statue, we can see why. 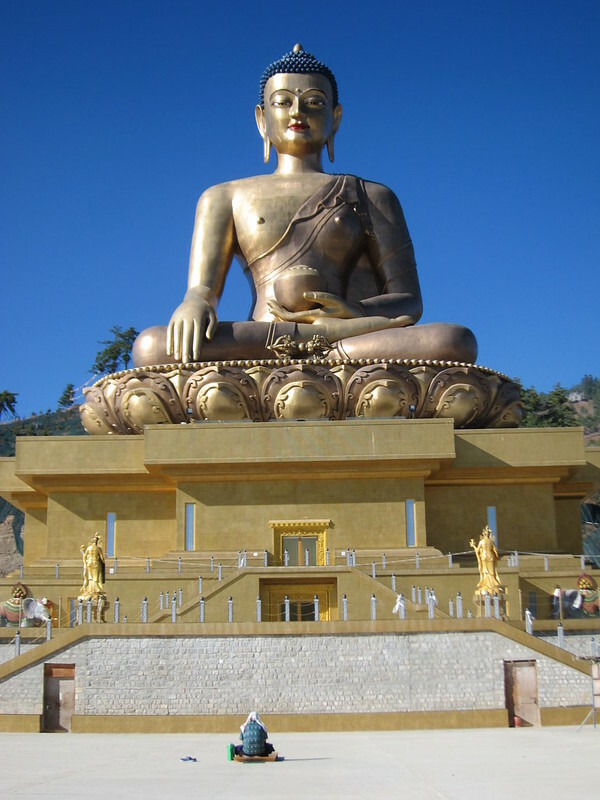 At 51 metres, this bronze Buddha aspires to be the largest and tallest statue of Lord Buddha in world. Construction started in 2007 and eight years later, the whole complex is still a work in progress. So Nam told us that although the project is governed by the Bhutanese government, the funding came from a few countries, such as China and Singapore. This is in fulfillment of a prophecy made in the 15th century. I didn’t probe him further as I was awed by how huge the Buddha was. Yes, that’s about the scale of the statue. Inside the Buddha body, it housed 125,000 smaller Buddha statues (as comparison, the one at Shatin house 10,000). 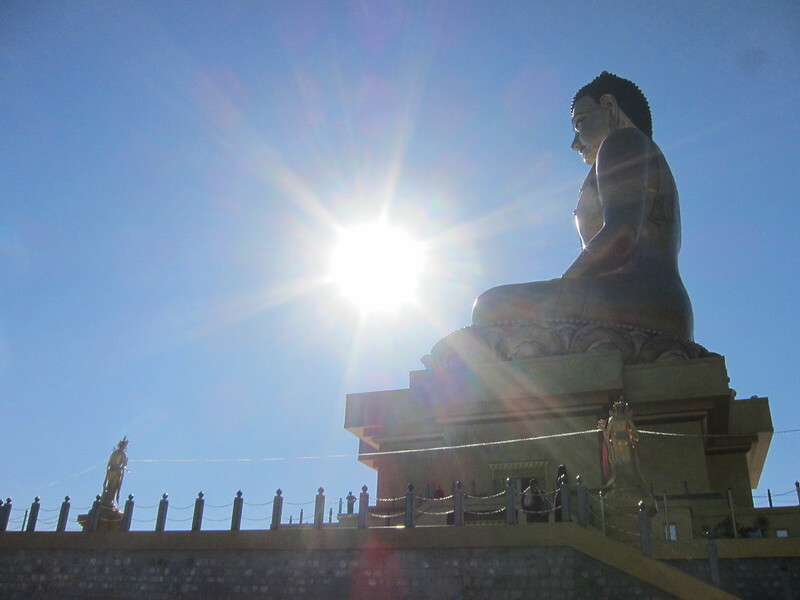 The throne of the Buddha was made out of golden tiles, and in the bright sunlight the whole thing shone like a second sun. Inside, the walls were bright and vivid with colours and symbols of Buddhism. Everything was spanking new, and though they looked great, I was very much looking forward to something… older. And hence I didn’t spend too long looking at freshly painted paint and new statues, and after some time I went back outside. Buddha Dordenma sits high up on a mountain at the entrance to the valley of Thimpbu, and it commands an incredible view of the capital city. From this vantage point one can see how “far” Thimpbu stretches into the distance (read: not very), and how quaint the town is situated in between mountains. If Bhutan is the place of happiness, than perhaps this is the real happy valley (Hong Kong readers would know what I mean). Our itinerary of the day also include a visit to the Trashi Chhoe Dzong (dzong means “fortress”), and I was quite insistent that we do it in Bhutanese costume. So off we went to the weekend market. 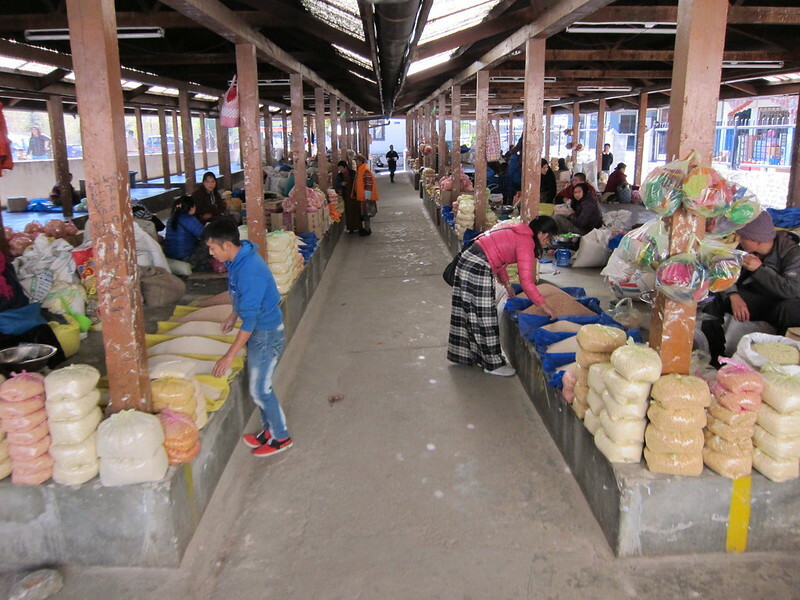 If your visit to Thimpbu happens to be on a weekend, make sure you pay a visit to the weekend market, which happens on both side of the banks of Wang Chhu river, just borth of Changlimithang Stadium (fun fact of the stadium: it is home to the office of Bhutan Olympic Committee, and the training ground of the national soccer team). We started off visiting the produce section, particularly the “cereal” stalls. At first I thought we were visiting stalls selling rice grains of various colours, but on closer inspection, I found that they were really selling cereals of various types, along with white, red and brown rice. 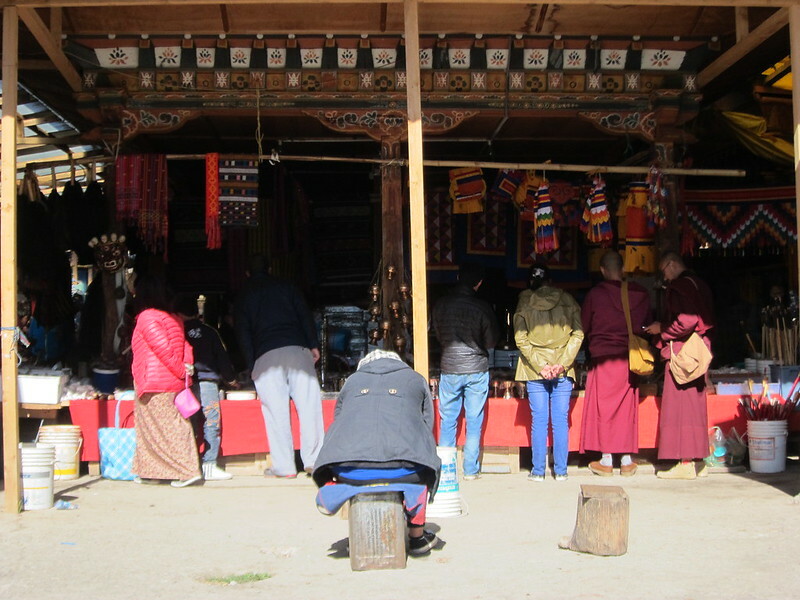 We were the only customer/tourist around, and we couldn’t have stood out more with our shades and cameras at the ready, but the Bhutanese vendors – said to have traveled from other regions of Bhutan to Thimpbu for the weekend market – didn’t seem to mind. The vegetable section was infinitely more interesting. 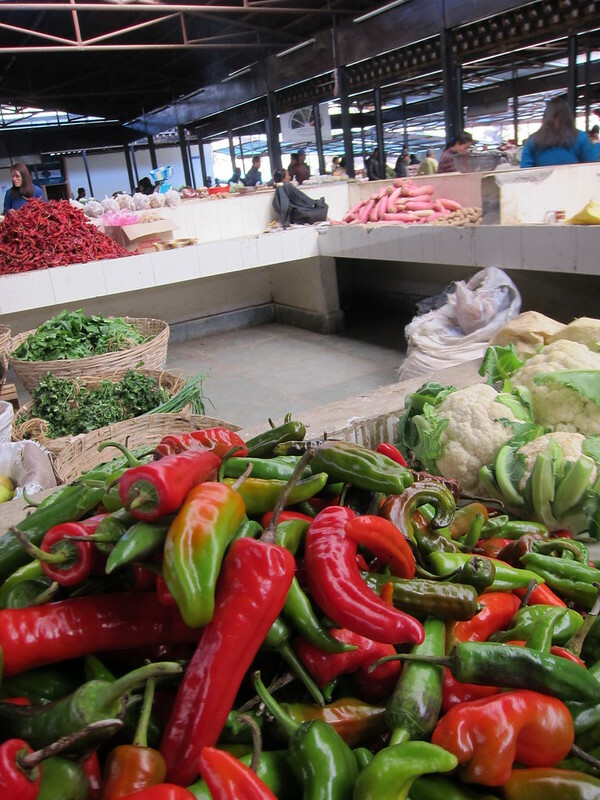 Here’s one can experience the love the Bhutanese have for their chillies. There were green chillies and red chillies and every chillies coloured in between. Big ones were piled up like a mountain, while small, often more potent ones (bird eye chillies) were packed in small bags. Every stalls seem to be selling similar things, thought some stood out more with balls of home made cheese and aromatic incense. At the handicraft section, after a brief walkthrough the section selling artifacts, we went to look for our Bhutanse costume. 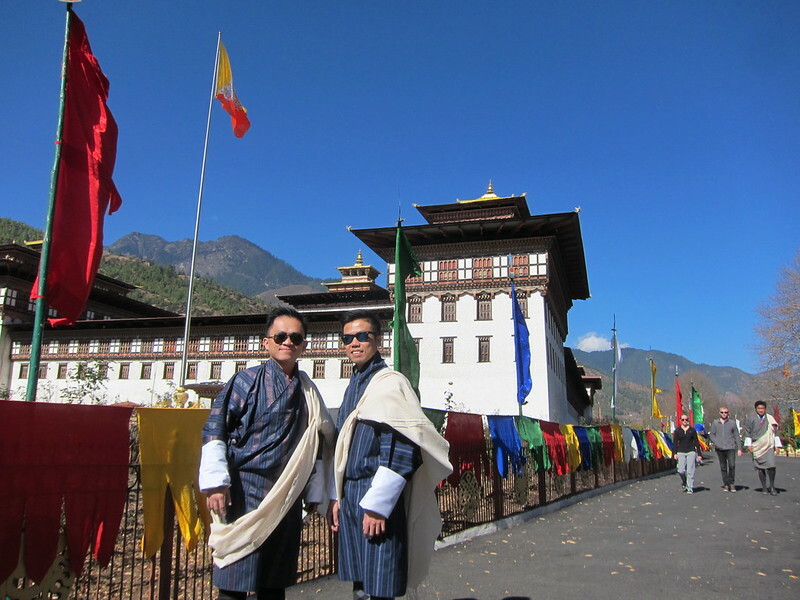 As we were about to visit the dzong, So Nam told us that we have to find white ceremonial scarfs as well, called kabney. The costume, named gho, was easy enough to find. We had fun thumbing through a stack of these costumes, available in many different colours and hues. There were two types, one with inner lining, and one does not. Apart from the additional layer which could be used as insulation, I couldn’t tell what other differences they might have apart from that the difference in price, which was a mere Nu 200-300. And on we tried the gho. Putting on requires some practice, and since we are newbie to this our guide has graciously helped us in putting the look together. Both of choose one that is more subtle, in shades of blue. The gho is wrapped around your body and then tied across your waist – very tightly, like a corset – using a colourful belt creating a skirt and a baggy upper “space” that was nicknamed “the largest pocket in the world”. And they are not kidding. I fit a camera, wallet, books, water and everything else in there, and because of the tight belt everything would not fall out of the gho. Pretty handy, I must say! The two sets of costumes – including the white sleeves and knee length socks – set us back some Nu 3,800 (about HKD500). Bargaining is a custom here at the market and your tour guide is usually happy to do that for you. Finding the kabney wasn’t as easy as the gho. After asking several stalls to ask if they sell one, So Nam wasn’t about to give up and by our tenth stall, the entire market seems to know we were looking for a kabney. After some relentless effort, we finally found our kabneys – one each at a different stall – and our mission is complete! We then went back to our hotel to change properly into the costume, which took some time. Both So Nam and Deepak seem very pleased that we took the trouble to get into their costume (I noticed that most tourists are perfectly happy in their normal clothes), and so they took great pain in making sure we were presentable. Jeans are not appropriate to be worn inside your gho, so the knee length socks are important. On colder days you might want to get warmed up with a pair of leggings. 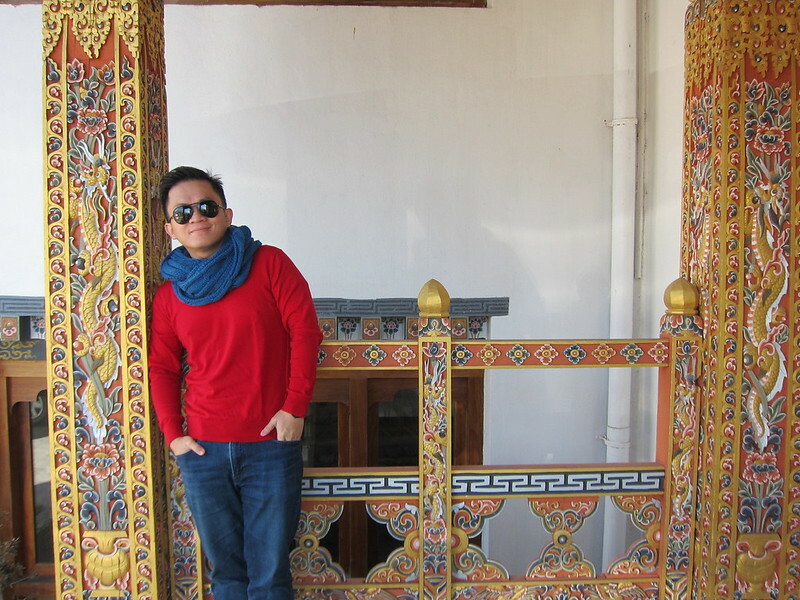 Once we were donned in some of Bhutanese finest, we are off to visit the Trashi Chhoe Dzong. The dzong, which was visible from the Buddha statue vantage point, is not the largest in Bhutan, but it serves the most important function. One half of it was dedicated to the offices of government, and the other half are for the monks – a monastery. The dzong is the summer residence for the monks, and during this time most of the monks are at Punnaka, where they reside for the winter. 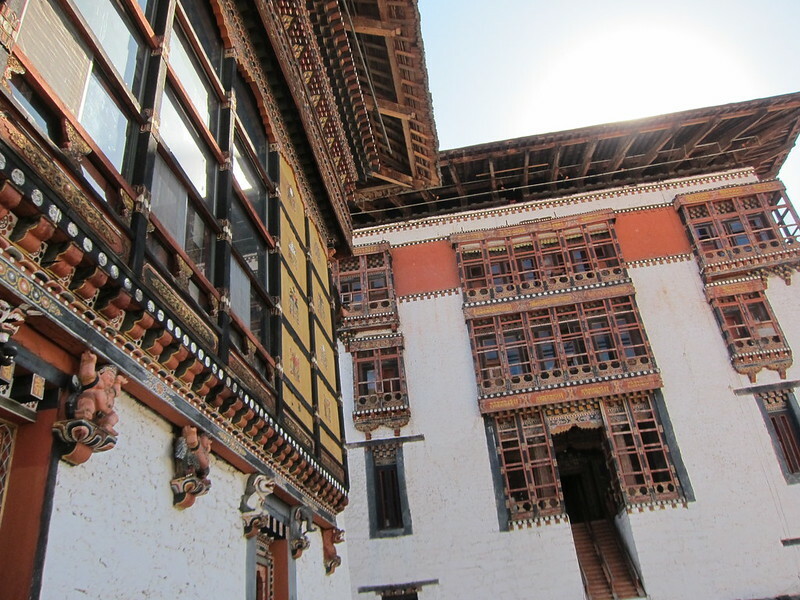 Also on normal days, the dzong is not opened to public, but since it was a Sunday, we were able to get inside. The dzong was a photographer dream comes true. Because December is the “shoulder season” the number of tourists is low in Bhutan, and on this occassion we had the enormous dzong all to ourselves. 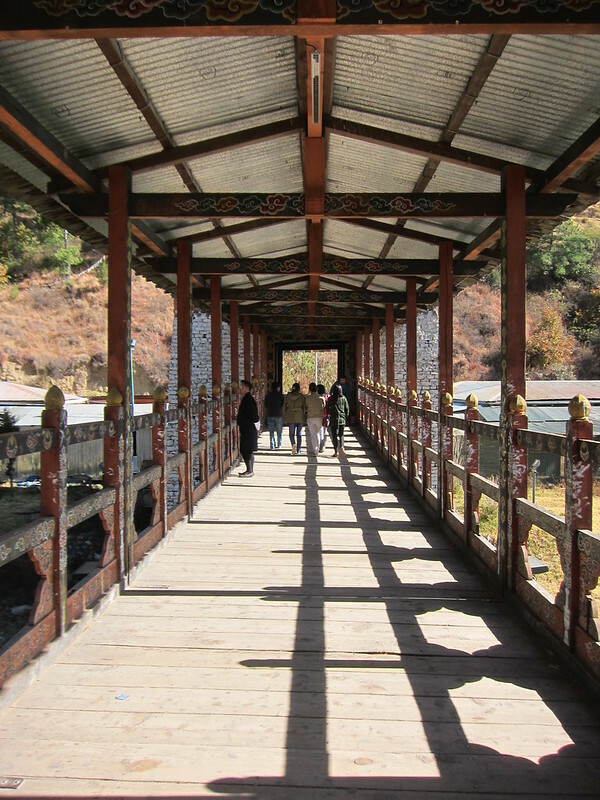 I quickly recognise that this is the place where the colourful Bhutanese festival was held at, where throng of the local people and tourists alike would gather for dances and ceremonial ritual. For now, the vast courtyard stood empty. 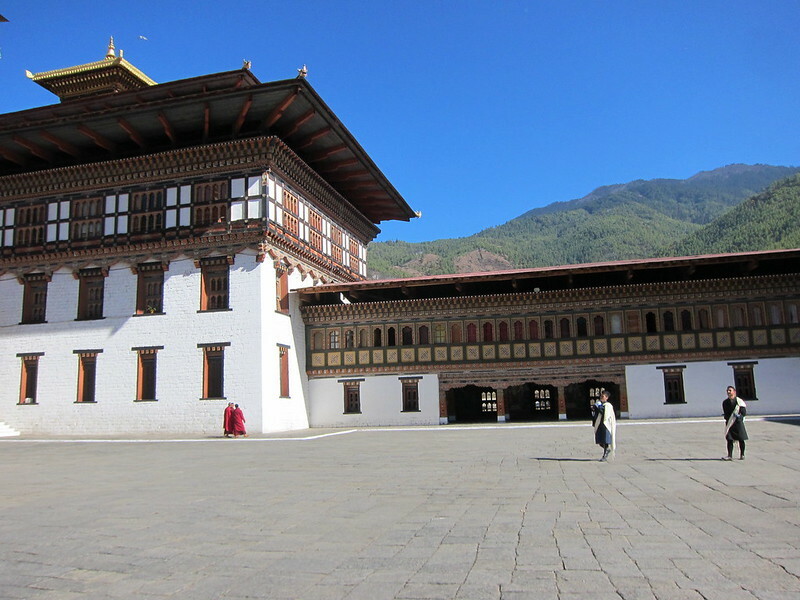 I feel dwarfed by the huge dzong, and it was hard to be awed by the majestic building. A few monks were seen scurrying, but apart from them, we were on our own. We spend some time inside one of the main building, a temple dedicated to the Lord Buddha, and his disciples. Nam took great pain explaining to us the various statues in the building (no photos were allowed), though to be honest all I remembered was the disciple who yet to be a Buddha and turn an ugly shade of red when he is angry, and the statue of the founding father of Bhutan. Fun fact: This founding father was so important that he commanded a place in the temple. He was the one to bring together the Bhutan as it is now, with its language and costume, and it’s running of government and religion. I asked if this is an example “one country, two systems” (referring to how Bhutan was governed by both the administrative and monastery offices), and So Nam corrected me that the more appropriate description would be “one country, dual system”. 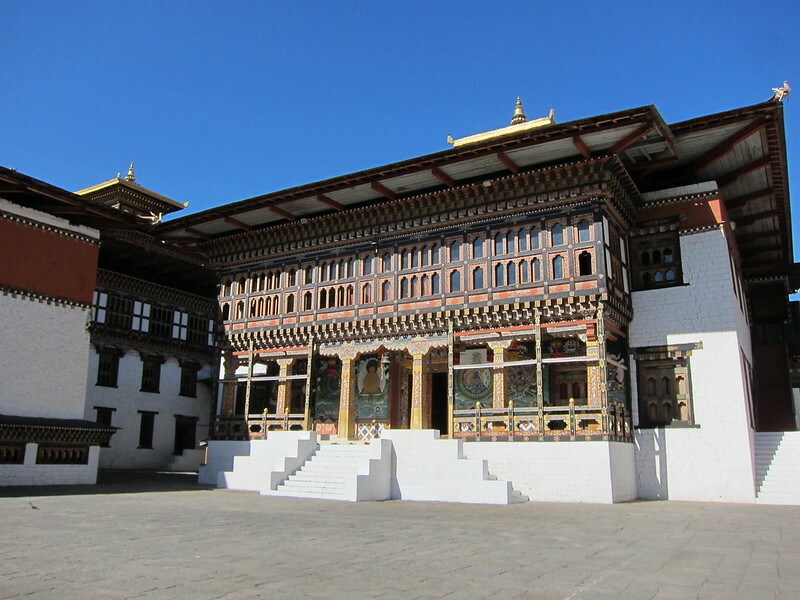 He further elaborated that in Bhutan, one can’t exist without the other, and both the administrative office and monasteries keep each other in check and in balance. There were also three main seats in the temple, very important during important occasions and festivals. The King of Bhutan sits in the middle, his father to the left, and the Chief Abbott to the right. This serves to further remind the important link between governance and religion in Bhutan. After the visit to the dzong, it’s time for lunch. 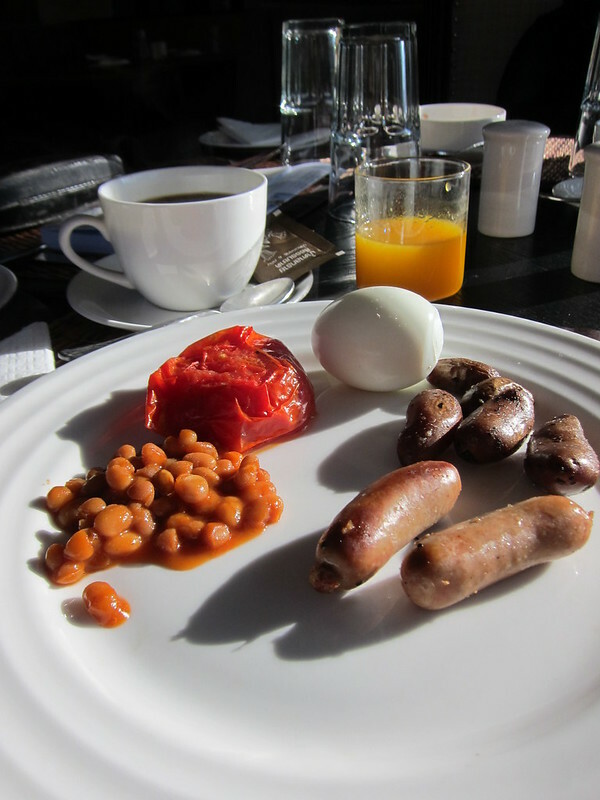 We went back to the town centre and had our fill at Edelweiss Restaurant. 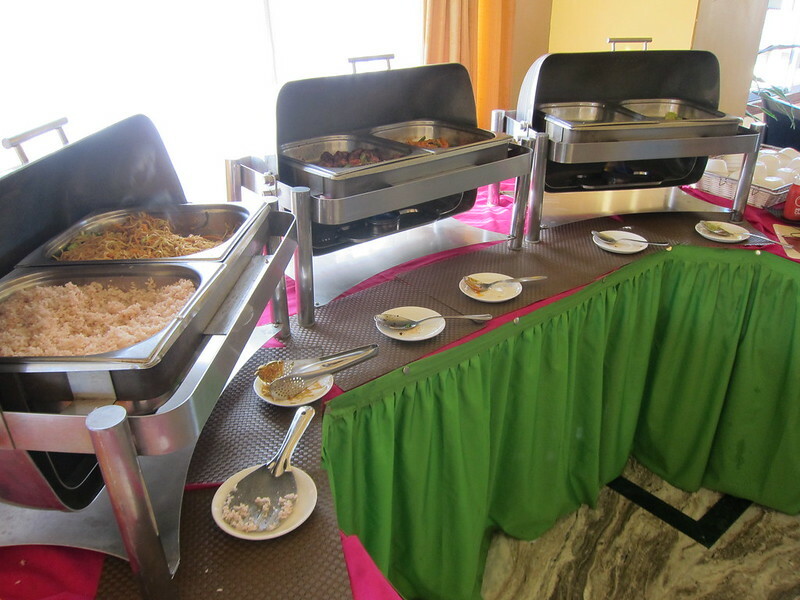 Standard fare like red rice, beef and chicken are available buffet style, but the selection was limited though I can understand why (we were the only other customer tables in an otherwise empty restaurant). It was also here I had my two firsts – chillie with cheese (they were hot but delicious!) and Druk beer (tasted rather bland). After lunch, we went to watch some Bhutanese archers in action. 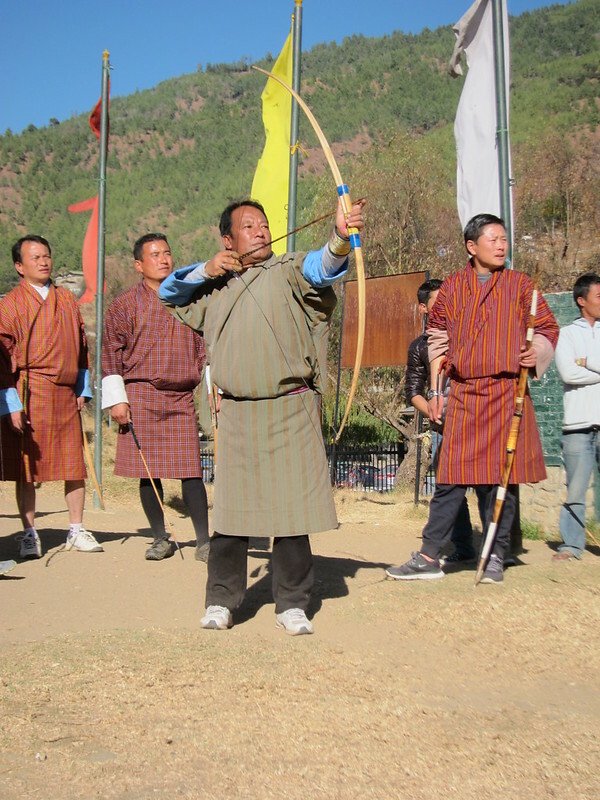 The ancient game of archery in Bhutan is played using traditional arrow and bow, and one has to hit a tiny target plank placed 150m from the archers. To my untrained eyes, it seems like too great a distance (it was, by modern achery standard), but the archers were experts. Though only a few hit the plank, most arrows landed very near to it. There was a great sense of camraderie as the archers cheered each other on, while some spectactors like yours truly looked on in much excitement, cameras snapping away. This felt like watching rugby in Happy Valley on a Sunday (again, Hong Kong readers will know what I meant). Our final destination of the day was the takin preserve. Takin is the national animal of Bhutan, a cross between goat (the face) and bull (the body). To be honest, I didn’t remember asking to visit the takin preserve, so I was a little puzzled why my tour guide decided that the animal was important enough to be on our itinerary. 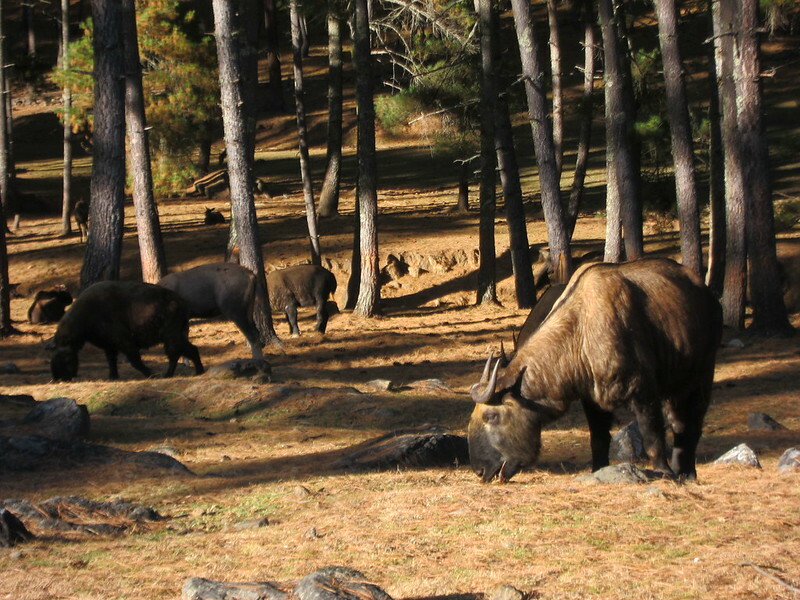 But I have to say that visiting the animal preserve serves a lesson on its own – that the Bhutanese care for their animals, and they will go to great lengths to preserve their nature and all which live in it. By the time we hiked down from the takin preserve, I was already knackered out and ready to call it a day. If this little hike (if you can call it that) seems a tad taxing, I couldn’t imagine how hard it is to be to climb up to Tiger’s Nest on our last day. This was a prospect I anxiously contemplated as I was trying to take a nap. And eventually I succumbed to my tiredness and fell asleep. Dinner was arranged at a restaurant downtown, rather near to the place where we had lunch. 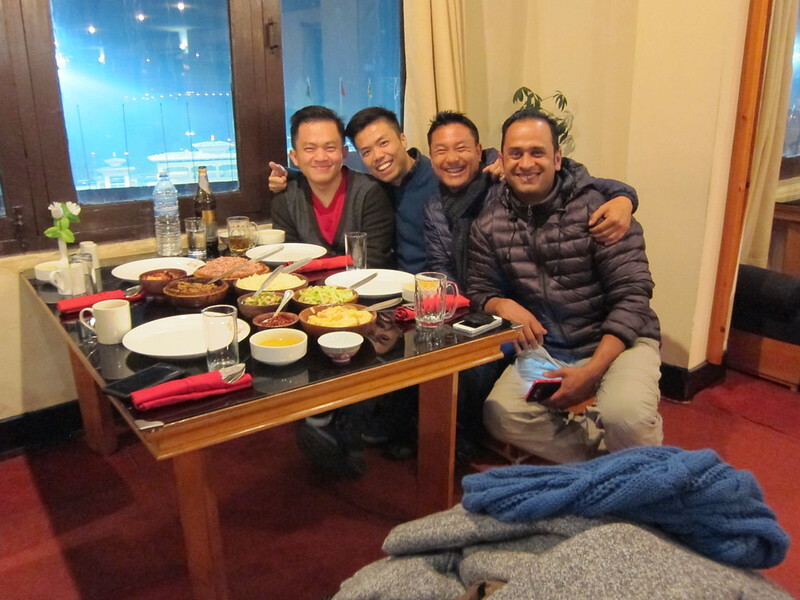 I have asked not to have dinner in the hotel, as it seems rather wasteful to leave so much food uneaten, and I also asked So Nam and Deepak to join us. They choose the Bhutan Kitchen, which – again – apart from the waitresses and some playful, friendly cats, was completely empty apart from our table. It was here I had my third first – tea with butter. As it can be quite an acquired taste, So Nam took the liberty to order only a small bowl for each of us. 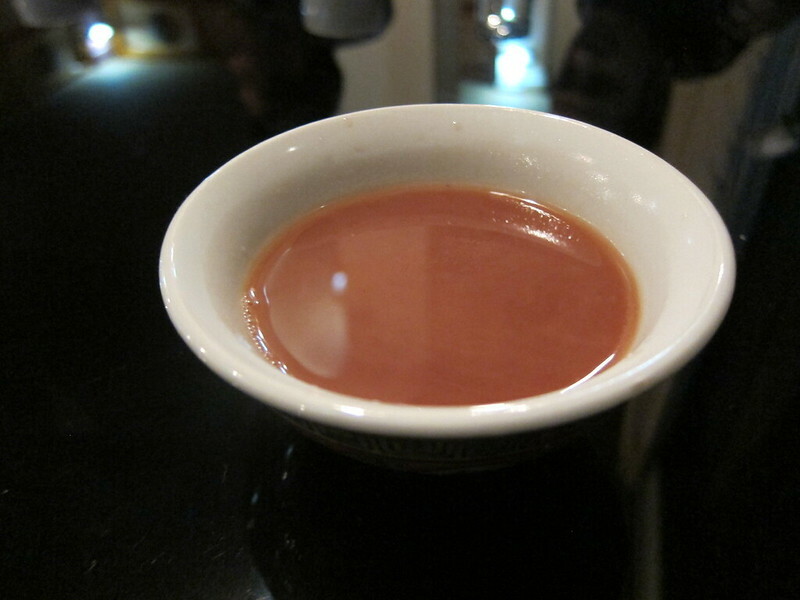 The tea tasted like soup, and we were told that it is quite the staple for folks living in higher altitude. The tea serves to keep their bodies warm, and the butter also double up as “lip balm” to protect their lips from the cold weather. I nodded in agreement as I sipped my soup. Food was served to our table in dishes. 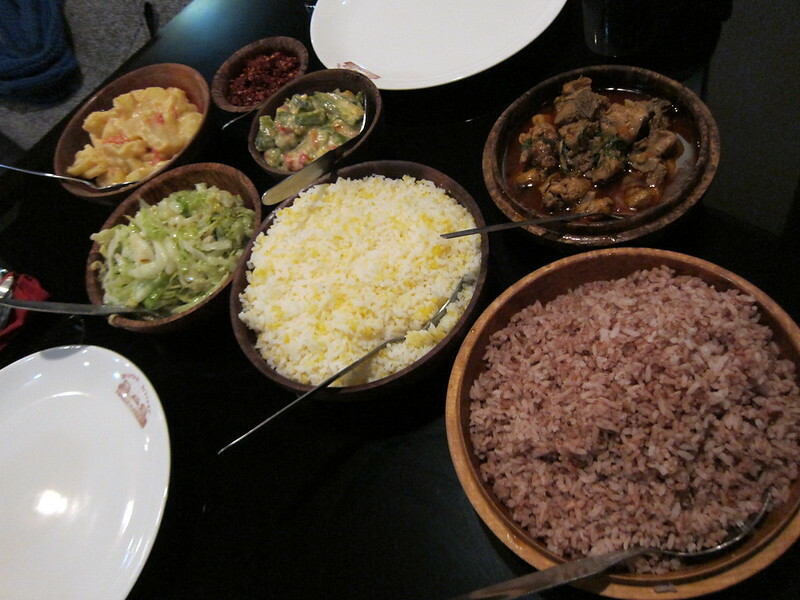 There were two selections of rice, and a host of other spicy food – chicken curry, pork curry, chillie in cheese, chillie paste… in fact, the only non spicy food that night was the potatoe in cheese, which was delicious. Over dinner, I begin to understand why Bhutan is the happiest place on earth. 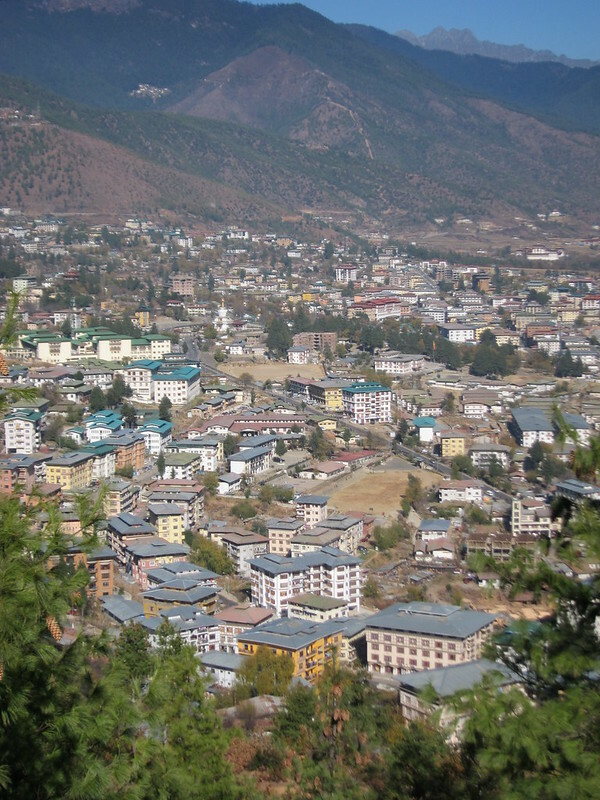 We often thought the people of Bhutan is happy because of the vast green reserves and unpolluted air. We thought they are happy because of their beautiful country and great history. Even their tourism tagline – happiness is a place – seems a little misleading. For I discovered that the happiness in Bhutan lies within its people. Their lives deeply immersed in spirituality and appreciation for what they have (instead of what they don’t have) have led them down a path of contentment, forgiveness, and love for others. Like So Nam said, no one can tell you how you feel, and you can always find happiness on the inside. 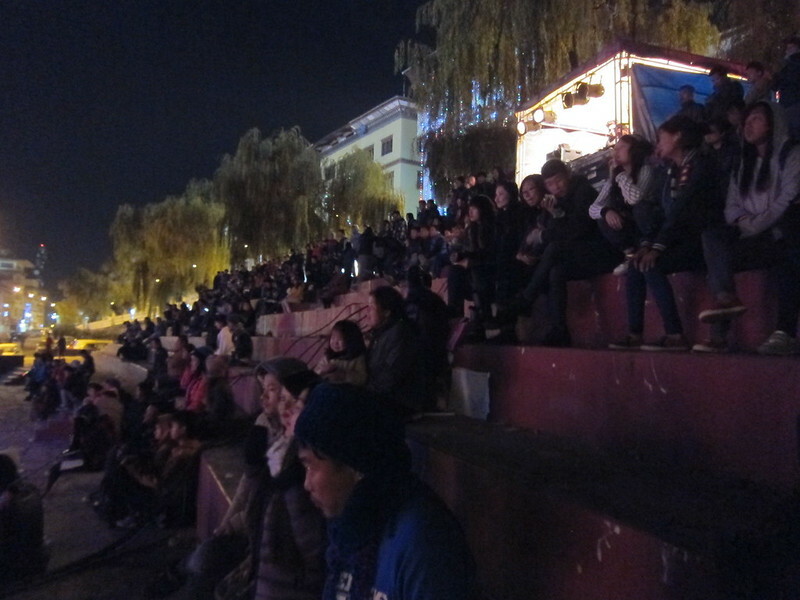 As we contemplated the words of our extremely wise tour guide, we walked to the clock tower square, where throngs of young Bhutanese gathered in the chilly night to watch some open air performance. It seems like such a contrast from our deep conversation back at the restaurant, but I took it in my stride. Truth to be told, I had watched better performances in my life, but the enthusiasm of the local people singing along to the performers was contagious. I was still grinning ear to ear as we walked back to our hotel in the chilly night.